Tiger Woods' victory in the Masters Tournament gave Nike stock a boost Monday. Is there more to come? On Sunday afternoon, Tiger Woods captured his 15th major victory when he won the 2019 Masters Tournament. After years of struggle and 14 years after his last Masters victory, Woods finally got his fifth green jacket after winning the tournament. Nike (NKE - Get Report) is one of the few sponsors that stuck with Woods through all the drama over the years. Well, with the recent turnaround in his game, the company may be a big beneficiary of a resurgent Woods. Shares pressed higher by 0.7% in Monday trading, closing at $86.83. Is Wood's Masters victory enough to jumpstart the stock and push it to new all-time highs? Let's examine the charts. Nine-month daily chart of Nike stock. About a month ago, we looked at Nike stock after the company reported better-than-expected earnings. However, management issued guidance that did not thrill Wall Street, so the stock took a dive after the report. Nike stock gapped down and broke below its 50-day moving average in its first post-earnings trading session. In the second session, it was able to rally to the 50-day, but could not reclaim it. The next few days were more of the same, until Nike stock finally penetrated the 50-day, which has acted as support for weeks now. Following the Tiger Woods victory, shares are moving even higher over the past few days. Getting over and staying above $83 was important and that could be the same situation that plays out with the $85 level. 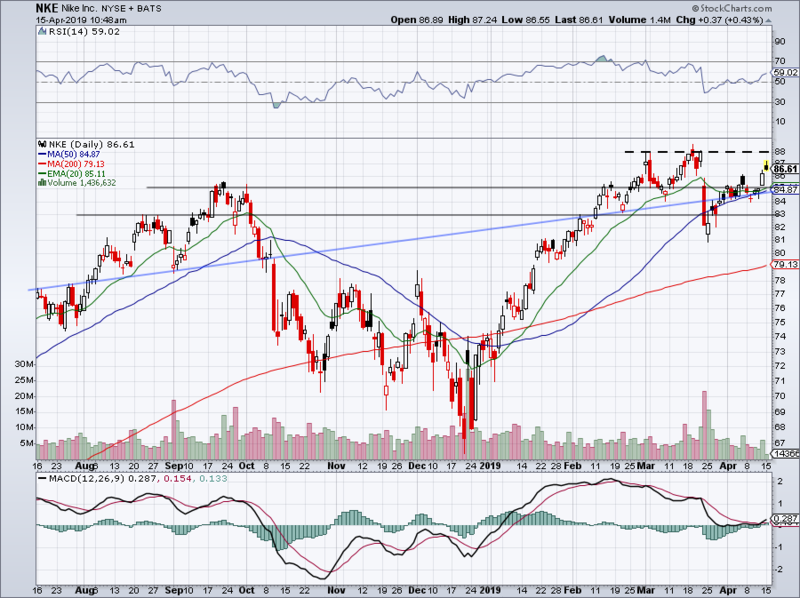 Should it act as support and Nike stock's recent momentum continue, the $88 level is surely within reach. If Nike gets there, logic says new highs over $88.59 are a possibility. What about the downside, though? Below $85 would be the most immediate cause for short-term concern. Beneath that mark puts NKE stock below various support levels, as well as the 20-day and 50-day moving averages. Remember, the latter of those two moving averages has proven to be significant. Below $85 will place $83 and the post-earnings low near $81 back on the table. If that's the case, we could get a potential pull back into the 200-day moving average and the $79 to $80 support zone we highlighted last month.